The 2016/2017 snooker season was a series of professional snooker tournaments played between 5 May 2016 and 1 May 2017. The number of ranking events has been increased in 2016/17, with a target of 20 ranking events in 2017/18. According to the World Snooker chairman Barry Hearn, total prize money for the World Snooker Tour in 2016/17 hit £10 million for the first time ever. The trophy for the Masters was renamed the Paul Hunter trophy in perpetuity, in memory of the three-time Masters champion who died in 2006. The Snooker Shoot-Out became a ranking event for the first time. The Australian Goldfields Open has been cancelled. The Players Championship featured the top-16 players on the one year ranking list, as the Players Tour Championship has been cancelled and no order of merit was issued. The new Home Nations Series was introduced in this season with the English Open, Northern Ireland Open, Scottish Open and Welsh Open tournaments. The winner of all four tournaments could earn a massive £1 million bonus prize. The top 64 players from the prize money rankings after the 2016 World Championship, and the 30 players earning a two-year card the previous year automatically qualified for the season (Vinnie Calabrese has resigned his membership). The top eight players from the European Tour Order of Merit and top two players from the Asian Tour Order of Merit, who have not already qualified for the Main Tour, also qualify. Another two players come from the EBSA Qualifying Tour Play-Offs, and a further twelve places were available through the Q School. 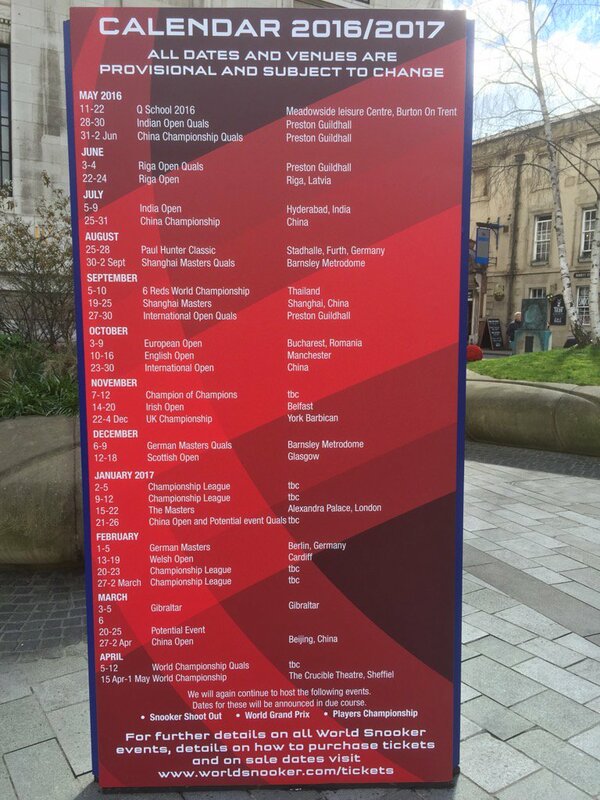 The rest of the places on to the tour come from the amateur events and national governing body nominations. Yan Bingtao's two-year tour card will commence this season. Also, since Steve Davis and Stephen Hendry have both retired from professional play, only James Wattana was offered an Invitational Tour Card. The list of all professional players in the 2016/2017 season includes 129 players. All players listed below received a tour card for two seasons. The following tables outlines the results and dates for all the ranking and major invitational events. "Seeding revision 0" are the rankings at the start of the season. ^ a b c d Players who lose their first match receive no ranking points. ^ "Snooker Shoot Out Becomes Ranking Event". worldsnooker.com. World Professional Billiards and Snooker Association. 11 May 2016. Retrieved 11 May 2016. ^ "Every Pound Counts... Snooker Race Set To Start". worldsnooker.com. World Professional Billiards and Snooker Association. 13 May 2016. Retrieved 14 May 2016. ^ What is the Home Nations series? ^ "Provisional End-of-Season Seedings". Snooker.org. Retrieved 6 May 2016. ^ "2016/17 Roll Call". wpbsa.com. 17 May 2016. Retrieved 18 May 2016. ^ "Amateur Order of Merit". worldsnooker.com. World Professional Billiards and Snooker Association. 13 July 2014. Archived from the original on 17 July 2014. Retrieved 6 May 2016. ^ "EBSA Order of Merit 2015/16". prosnookerblog. Retrieved 6 May 2016. ^ "Two Weeks Until Q School Deadline". worldsnooker.com. World Professional Billiards and Snooker Association. 23 March 2016. Retrieved 15 May 2016. ^ "Four More Tour Cards Available At Q School". worldsnooker.com. World Professional Billiards and Snooker Association. 29 April 2016. Retrieved 6 May 2016. ^ a b c d "Chinese Duo to Turn Professional". worldsnooker.com. World Professional Billiards and Snooker Association. 17 May 2016. Retrieved 18 May 2016. ^ a b "World Snooker Update". worldsnooker.com. World Professional Billiards and Snooker Association. 30 April 2016. Retrieved 7 May 2016. ^ "2016/17 Tour Professional Players" (PDF). worldsnooker.com. World Professional Billiards and Snooker Association. 1 June 2016. Retrieved 2 June 2016. ^ "Double delight for Thailand. Boonyarit & Siripaporn are new champions". Retrieved 5 July 2015. ^ "JAK JONES IS THE NEW EUROPEAN CHAMPION". European Billiards & Snooker Association. 21 February 2016. Archived from the original on 6 July 2016. Retrieved 21 February 2016. ^ "Ireland's Josh Boileau takes European Under-21 title and turns professional". RTÉ Sport. 14 February 2016. Retrieved 14 February 2016. ^ "WPBSA STATEMENT – LEO FERNANDEZ". World Snooker. Retrieved 6 July 2016. ^ "FLeo Fernandez handed 15-month ban after admitting corruption charge". BBC Sport. Retrieved 6 July 2016. ^ "Slessor And Craigie Win EBSA Play-Offs". worldsnooker.com. World Professional Billiards and Snooker Association. 14 April 2016. Retrieved 15 April 2016. ^ "Q School Order Of Merit". snooker.org. Retrieved 16 May 2016. ^ "Q School Ranking List". worldsnooker.com. World Professional Billiards and Snooker Association. 19 May 2016. Retrieved 20 May 2016. ^ a b "CBSA Announcement on World Snooker Tour Nominations". cbsa.com. 19 May 2016. Retrieved 26 May 2016. ^ "Yan Bingtao Tour Card Deferred". World Professional Billiards and Snooker Association. Retrieved 16 May 2016. ^ "Vienna Snooker Open 2016". Retrieved 6 May 2016. ^ "Vienna Snooker Open: Internationale Snooker-Stars kommen nach Wien". Retrieved 6 May 2016. ^ "South West Snooker Academy". Retrieved 6 May 2016. ^ "Robertson Rules in Riga". World Snooker. Retrieved 24 June 2016. ^ "Indian Open: Scot Anthony McGill secures first ranking title". BBC Sport. Retrieved 10 July 2016. ^ "Carter Captures World Open Crown". World Snooker. Retrieved 31 July 2016. ^ "Ali Carter back in world's top 16 after beating Joe Perry in World Open final". BBC Sport. Retrieved 31 July 2016. ^ "Selby first in Fürth". World Snooker. Retrieved 28 August 2016. ^ "Official Rules of the Games of Snooker and English Billiards" (PDF). World Professional Billiards and Snooker Association. November 2014. Retrieved 15 July 2016. ^ "Ding Claims Thrilling Six Red World Title". World Snooker. Retrieved 11 September 2016. ^ "Shanghai Masters: Ding Junhui beats world champion Mark Selby in final". BBC Sport. Retrieved 26 September 2016. ^ "Shanghai Success For Ding". World Snooker. Retrieved 26 September 2016. ^ "Judd Trump beats Ronnie O'Sullivan in European Masters final". BBC Sport. Retrieved 10 October 2016. ^ "Trump wins thrilling final". World Snooker. Retrieved 9 October 2016. ^ "Liang Wenbo wins first ranking title by beating Judd Trump in English Open". The Guardian. Retrieved 17 October 2016. ^ "Liang Claims Maiden Ranking Title". World Snooker. Retrieved 17 October 2016. ^ "Selby Crushes Ding in Daqing". World Snooker. Retrieved 30 October 2016. ^ "Mark Selby beats Ding Junhui to win International Championship in Daqing". Daily Mail. Retrieved 30 October 2016. ^ "China Championship: John Higgins beats Stuart Bingham in final". BBC Sport. Retrieved 6 November 2016. ^ "Higgins Is Guangzhou King". World Snooker. Retrieved 6 November 2016. ^ "Champion of Champions final: John Higgins beats Ronnie O'Sullivan 10-7". BBC News. 12 November 2016. Retrieved 13 November 2016. ^ "Northern Ireland Open: Mark King ends 25-year wait for ranking title". BBC Sport. Retrieved 21 November 2016. ^ "King Crowned in Belfast". World Snooker. Retrieved 21 November 2016. ^ "Mark Selby beats Ronnie O'Sullivan to win UK Championship final". BBC News. 4 December 2016. Retrieved 5 December 2016. ^ "Scottish Open: Marco Fu fights back to stun John Higgins in final in Glasgow". BBC News. 18 December 2016. Retrieved 19 December 2016. ^ "Brilliant Fu Claims Glasgow Victory". worldsnooker.com. World Professional Billiards and Snooker Association. 18 December 2016. Retrieved 19 December 2016. ^ "Ronnie O'Sullivan beats Joe Perry to win record seventh Masters title". BBC News. 22 January 2017. Retrieved 22 January 2017. ^ "Anthony Hamilton lifts German Masters to win first ranking event". Eurosport. 5 February 2017. Retrieved 6 February 2017. ^ "World Grand Prix: Barry Hawkins beats Ryan Day to win title in Preston". BBC Sport. 12 February 2017. Retrieved 20 February 2017. ^ "Welsh Open 2017: Stuart Bingham beats Judd Trump 9-8 in final". BBC Sport. 19 February 2017. Retrieved 20 February 2017. ^ "Anthony McGill wins one-frame Shoot Out tournament". BBC Sport. 26 February 2017. Retrieved 27 February 2017. ^ "John Higgins Wins Championship League". 3 March 2017. Retrieved 4 March 2017. ^ "Gibraltar Open 2017: Murphy beats Trump in final". 5 March 2017. Retrieved 6 March 2017. ^ "Players Championship: Judd Trump beats Marco Fu 10-8 final". BBC Sport. 12 March 2017. Retrieved 13 March 2017. ^ "Stephen Hendry beaten as Peter Lines wins World Seniors event". BBC Sport. Retrieved 26 March 2017. ^ "China Open: Mark Selby beats Mark Williams 10-8 to ahead of World Championship". BBC Sport. 2 April 2017. Retrieved 2 April 2017. ^ "Mark Selby beats John Higgins to defend his World Championship title". BBC Sport. 1 April 2017. Retrieved 2 May 2017. ^ "Indicative prize money rankings schedule 2016/2017 season" (PDF). World Professional Billiards and Snooker Association. Retrieved 3 June 2016.